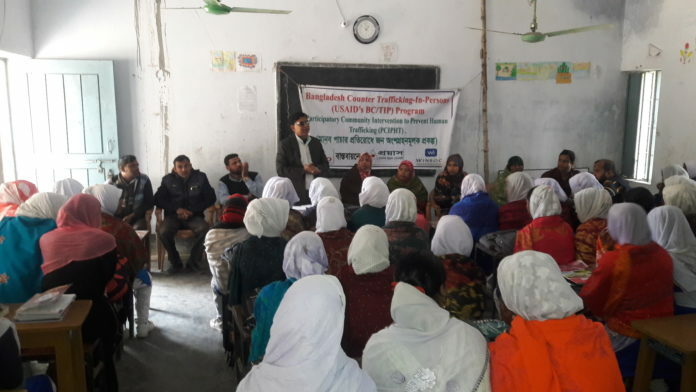 To contribute in combating the human trafficking from Bangladesh, including unsafe migration, Proyas has been implementing the Bangladesh Counter Trafficking in Person (BCTIP) project with the funding from Winrock International/USAID since May 2017. This project has three strategic areas, i.e. Prevention, Protection and Procecution. Proyas is the implementing partner for prevention areas and is working in five districts i.e. Chapainawabganj, Rajshahi, Naogaon and Dinajpur. To sensitize and build capacity of the local administration, civil society and service providers in prevention of human trafficking and unsafe labor migration.